It’s not quite Throwback Thursday, but Sega wants you to be prepared for tomorrow. Just today, the company added the official pixelated soundtracks to some of your childhood favorites to its official Spotify channel. 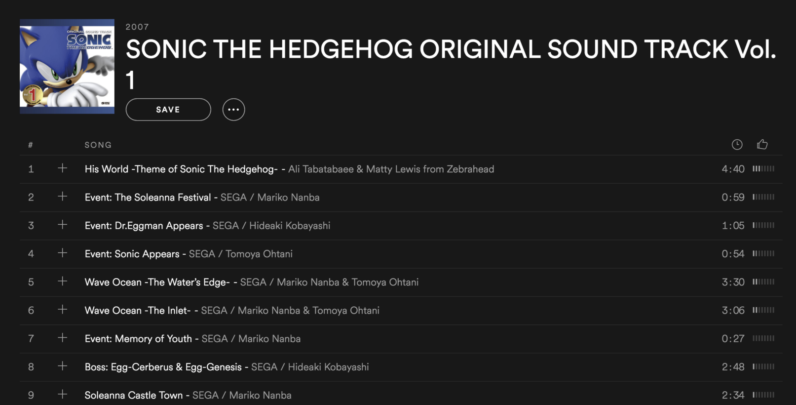 That’s right, Sega has a Spotify channel. Inside, you’ll find classic soundtracks like ‘Out Run,’ ‘Sonic the Hedgehog’, ‘Shinobi,’ ‘Golden Axe,’ ‘Virtua Fighter,’ and ‘Jet Set Radio’ accompanying lesser-known faves like ‘Skies of Arcadia’ and ‘Chain Chronicle.’ There are over a dozen full albums to choose from and all are begging your inner child to give them a listen. TechCrunch likes the Out Run soundtrack, but if we’re being honest with ourselves we should all agree that Jet Set Radio is where it’s at.